After being absent for over 10 years, this year the most anticipated conference for Exchange minded people took place in Orlando, Florida (US), the Microsoft Exchange Conference 2012 (MEC). 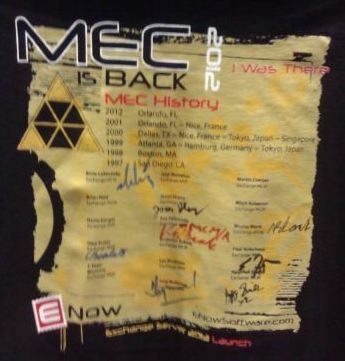 Despite not being able to attend MEC 2012, I’d like to summarize the news on Exchange 2013 from the event. Some of this information went public as part of the release of Exchange 2013 Preview, which was released in July (yes, almost 2 months ago – time flies). Some statements were new, like for example the expected release date of Exchange 2010 SP3, which is required for co-existence with Exchange 2013. With all the social media nowadays, you can track most of the statements made at the event. Thanks to people like Jeff Guillet and Devin Ganger and people from our The UC Architects group, like Dave Stork, Michael van Horenbeeck, Pat Richard, Serkan Varoglu and John A. Cook, who reported live from the sessions they were attending (hastag #iammec), the community was kept up to date with information as it unfolded. At each the end of the day, Tony Redmond gave a nice summary including comments on the event as a whole. the Ask Perry videos. The picture is taken by Tony Redmond. The information presented here is a summary of all the information provided through social media and is additional to the information presented at the release of Exchange 2013 Preview; you can read all about that in my Changes in Exchange 2013 Preview article. It is in no way meant to be conclusive or complete. Ok, now on to the goodness. Exchange 2010 Service Pack 3 is expected to be released in the first half of 2013. Not only is it required for co-existence with Exchange 2013, it also supports Windows Server 2012 as Operating System platform. Note that SP3 will require a schema update. No word on the expected release date of the update required for Exchange 2007 to support co-existence between Exchange 2013 and Exchange 2007. Since Exchange 2007 SP3 Rollup 8 was released in August, thus after the Exchange 2013 Preview became available, I assume we have to wait for Rollup 9 (or 10?). Ross Smith from the Exchange Team confirmed the 99% IOPS reduction claim when comparing Exchange 2013 with Exchange 2003; when compared with Exchange 2010 it’s a 50% reduction. 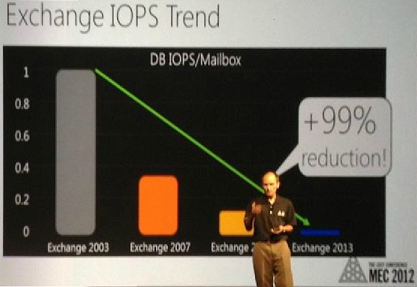 That’s down from 1 IOPS per mailbox in Exchange 2003 to .125 IOPS in Exchange 2010 to a 0,0625 IOPS per mailbox in Exchange 2013. Also, passive copies have around 50% reduction in IOPS, mainly due to the increased checkpoint depth (100MB) and less aggressive pre-reading of data to keep in line with the checkpoint depth (I’ll devote a separate article on this at a later date). This means when mixing active and passive copies on a Mailbox server, the passive copies play more nicely from a storage perspective. Also, because of these changes database fail-over times are down from 20 seconds in Exchange 2010 to about 10 seconds in Exchange 2013. To validate storage for Exchange 2013, JetStress for Exchange 2013 will become available 3 months after Exchange 2013 goes RTM. When required to validate storage in the mean time, it is recommended to utilize Exchange 2010’s version of JetStress since Exchange 2010 and Exchange 2013 will have the same IO pattern. In Exchange 2013, multiple databases per storage volume allowed, which allows for active and passive copies on the same volume. Looking at the lower IOPS requirements of Exchange 2013 ESE’s engine and the 50% lower IOPS factor of passive copies, this allows for some serious consolidation on large volumes. The number of volume copies must match the number of databases per copy. Note that putting databases on SMB3 shares (Windows Server 2012) is not supported; putting a virtualized Exchange server on SMB3 shares is. Besides the recommendation to embrace 7,200 RPM disks for Exchange storage, large mailbox implementations are expected to take off (100GB+, including mailbox, archive and recoverable items) in an ongoing battle to get rid of PSTs and 3rd party solutions. Due to database accounting changes in Exchange 2013, mailboxes may see a 30% increase in size when moved from Exchange 2010 to Exchange 2013. Make sure you adjust mailbox quota settings accordingly. CAS 2013 will proxy client traffic to Exchange 2010 using the CAS 2010 server’s FQDN, i.e. it won’t determine or use internalURL or InternalNLBBypassUrl. You can’t configure CAS-to-CAS proxying per site; it’s an all or nothing setting. At RTM, Exchange 2013 Client Access servers won’t contain support for SSL offloading. Exchange 2013 will not only check the server’s health looking at the Exchange services, but it will also check the protocols. CAS 2013 will determine the health of legacy Exchange servers using a simple HTTP HEAD call. Besides the ability to seed databases using multiple sources, which prevents the situation where multiple remote copies are seeded over WAN links from the active copy, Exchange 2013 contains a feature called Automatic Database Reseeding or just AutoReseed. AutoDagDatabaseCopiesPerVolume sets the number of databases copies per volume. So for example, when you’ve configured a mount point C:\Volumes (AutoDagVolumesRootFolderPath) containing mount points for databases, e.g. C:\Volumes\DB1, and mount point C:\Databases (AutoDagDatabasesRootFolderPath) with mount points to Exchange databases, e.g. C:\Databases\DB1 (where C:\Databases\DB1 maps to C:\Volumes\DB1), and DB1 contains folders for database and logfiles, AutoReseed can utilize mount points from C:\Volumes to automatically recreate and reseed databases when DB1 fails. Exchange 2013 will feature an automatic site (datacenter) fail-over using a witness server located in a 3rd well-connected site. This enables customers to automate the process of site switchovers, from primary to secondary site. This feature is optional. Despite this, I think this certainly is a valuable feature. Normally, site outages and datacenter switchovers are stressful situations; if it’s preconfigured and automated, the less prone to error the switchover process is. by F5. Click the image to watch the interview. You can use Exchange 2003 with Exchange 2013 Online (when it becomes available) by utilizing an Exchange 2010 CAS server, just like today. Safety Net is the new transport dumpster in Exchange 2013 and will provide similar functionality. It will also take over the functionality of Shadow Redundancy, which purpose in Exchange 2010 is to guarantee delivery of messages and accommodate for transport failure. Lagged Copy functionality is also enhanced by Safety Net, since you can activate lagged copies by activating the (lagging) copy after which Exchange 2013 will use Safety Net to make the database current. How long Safety Net will hold messages is a configurable setting. Exchange 2013 will support Litigation Hold, Time-based Hold (rolling data, e.g. items aged X days) and In-place Hold (formerly known as Legal Hold). The Exchange 2013 UM role has a 100 concurrent calls limit. As you probably know, in Exchange 2013 Mailbox servers are used for UM as well. Because of that, this limit will have serious consequences when you’re designing an environment using several big servers; you might be forced to distribute the workload over more, lighter servers. Exchange 2013 will work fine in conjunction with ForeFront TMG, except for maps feature when using TMG’s Forms-Based Authentication (FBA); the only thing you need to adjust is the logoff URL. Note that despite the ForeFront TMG 2010 End-of-Life statement from Microsoft last week, people like Greg Taylor (Program Manager Exchange) emphasized customers shouldn’t avoid using or opting for TMG while it is still available. Migration of Public Folders from Exchange 2007 or Exchange 2010 is a cut-over scenario, so there will be no co-existence. When using Exchange 2013 Public Folders next to Public Folders on Exchange 2007 or Exchange 2010, you need to manually map those to related folders in Exchange 2013 using CSV file. Emphasis was put on being able to control Public Folders and put that data in the same store is worth losing the multi-master functionality. for collecting the most autographs. Exchange 2013 will include tools to block messages in a certain character set. This is useful in scenarios where you don’t expect messages in one of the Chinese languages and you want to block (potential) spam written in one of those languages. The new term for Personal Archive or Online Archive is In-place Archiving. Exchange 2013 won’t use least-cost routing when routing messages, but it will use it to determine if Hub sites are defined. Exchange 2013 will honor Hub site definitions, but there are to be considered legacy. A Delivery Group is a set of transport servers responsible for delivering messages to a certain routing destination. There are several types of Delivery Groups, depending on the destination, e.g. DAG or Site. Each transport server is used in a Round-Robin fashion when delivering messages. An MBX server and CAS server listen for incoming messages on port 25 unless co-located; then the MBX server will listen on port 2525. More background information on message routing in Exchange 2013 also in conjunction with Exchange 2010 is to be found here. It is no longer required to have an Enterprise license for eDiscovery; it is still required to have an Enterprise license when using Legal Hold. Many statements were made to de-emphasize virtualizing Exchange and only use if for testing purposes. When virtualizing, the same rules apply as for Exchange 2010. Like with earlier versions of Exchange, the ESE engine will claim memory at startup using the amount of physical ram. Configuring Dynamic Memory is therefor not only pointless but also not recommended, like I stated in an earlier post on Exchange and Dynamic Memory. It is also emphasized that putting VMDK files on VMWare NFS disks is not a supported scenario, so I assume this is often seen in the field despite not being supported from Microsoft. ActiveSync in Exchange 2013 will cause 65% less RPC communications over Exchange 2010. When using OWA 2013 in offline mode, the locally generated cache file isn’t secure; use of BitLocker is recommended. Single Sign-On in combination with OWA on Exchange 2013 redirection will be fixed post-RTM. Also, be advised that at RTM, OWA in Exchange 2013 won’t have support for Public Folders. A portal for the Exchange community was announced, iammec.com. Here, people involved with Exchange can get information from within Microsoft or other sources. How this will differ from the Exchange related topics on TechNet forum is to be seen. It is unknown if there will be a MEC in 2013; Microsoft’s director of PM for Exchange, Michael Atalla, said there will a MEC when “theres’s something to talk about”. It is rumored that recordings of the 1st day of the conference will be made available at a later date, except for the interactive sessions. PS: The icon accompanying this article is the Exchange 2013 logo. This entry was posted in Exchange, Misc, TMG and tagged Coexistence, Exchange2013, Planning, TMG, Virtualization by Michel de Rooij. Bookmark the permalink. One correction on the hashtag people should search on for MEC-related tweets. The official hashtag was changed to #iammec so most of our coverage was done using that alone or together with #mecisback. Welcome. That AutoReseed might calls for a separate article at a later date to explain the process in more detail with more examples. i wonder if its suposed to work on this preview or not. i setup exactly as described and nothing happens when i remove one disk(containing either passive or active db. Wouldn’t a 99% reduction mean we went from 1.0 IOPS per user in 2003 to 0.01 IOPS per user in 2013? 🙂 0.125 was more of an Exchange 2010 value. Thanks for catching that, Brian! victim of my own editing ..